The DOSC is an active social group open to serving and former members of the Warrant Officers' and Sergeants' Messes (including Permanent Staff Instructors) of the Inns of Court Regiment, the City of London Yeomanry, the Inns of Court & City Yeomanry, the IC&CY Band of the Royal Yeomanry and 68 Signal Squadron. Its aim is to celebrate the esprit-de-corps and friendships of members of the Messes. The Club, which celebrated its 400th meeting in April 2010, meets on the third Tuesday of each month (except August & December) at 8pm in the Army Reserve Centre, 10 Stone Buildings, Lincoln's Inn and keeps its members in touch with a monthly newsletter. The AGM is held in October. 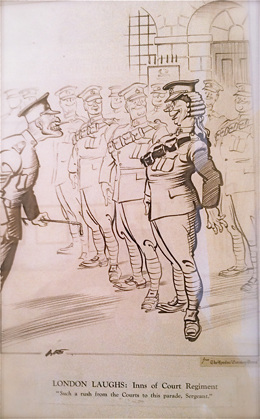 "Such a rush from the Courts to this parade, Sergeant," A cartoon by Lee published in the London Evening News on 3 June 1938.